ETFO traditionally has focused its political activities at the provincial level; the provincial government has the most direct impact on education policies and our members’ working conditions. Increasingly, however, ETFO has become concerned about the impact of federal policies on both our members’ welfare and the very fabric of Canadian society. The next federal election is scheduled for October 2015. ETFO believes there is much at stake and is determined to do what it can to affect the outcome. The success of this goal will depend on the extent to which ETFO members get engaged in the issues and the campaign. Since being elected in 2006, the Conservatives, led by Stephen Harper, have significantly changed the economic and social landscape of Canada and our role and reputation internationally. Conservative economic policies have favoured the wealthiest Canadians and reduced the government’s capacity to stimulate job creation and support the public services that contribute to an egalitarian and cohesive society. The Harper government has not only reduced the federal role, but also shifted priorities to focus primarily on the military, public safety and immigration. Under Harper, Canada has abandoned its role as an important diplomatic middle power and as a peacekeeper in international conflicts, opting for more militaristic roles. Through budget cuts and policy changes, Canada’s contribution to the economic and social development of developing nations has reduced significantly. Canada is seen as an outlier by its failure to address climate change. The Harper government has consistently attacked democratic rights, including those of unions, women’s groups and human rights organizations. 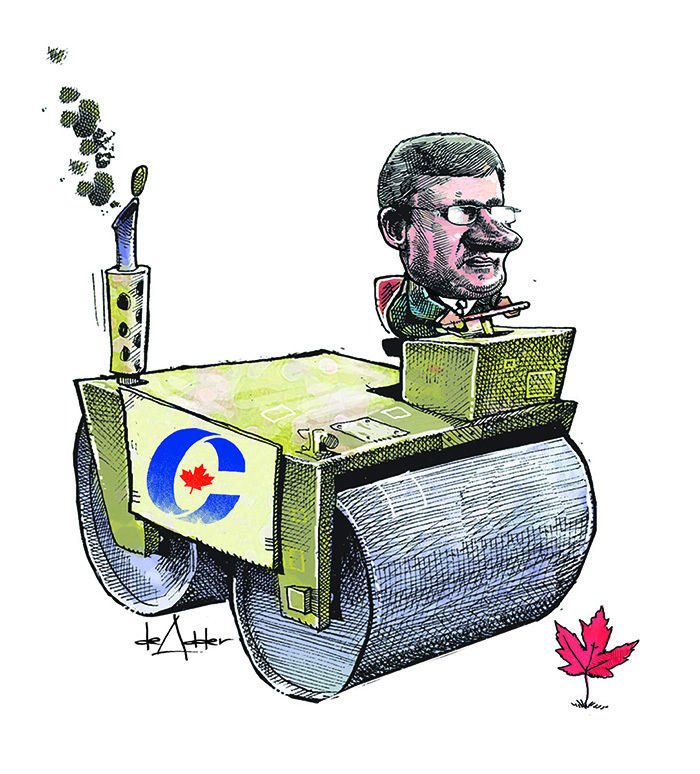 There is good reason to fear that, if re-elected in 2015, the Conservatives will transform Canada irrevocably. During its tenure, the Harper government has abused its authority to prorogue Parliament and introduced a “Fair Elections Act” that is anything but fair, making it harder for marginalized Canadians to vote. It has attacked unions and public advocacy organizations, suppressed research and information that informs public policy, and introduced laws – including the recent “anti-terror” law, Bill C-51 – that abrogate Charter rights. The Conservatives are unabashed in their opposition to union rights. In 2009, the government imposed caps on salary increases for federal employees. In 2011, it legislated locked-out postal workers back to work and imposed conditions that resulted in a wage settlement that was lower than the employer’s last offer. In 2012, it imposed a back-to-work settlement on Air Canada employees, removing their right to strike. In December 2012, the House of Commons passed Bill C-377, a private member’s bill that would require unions to disclose their expenditures on advocacy and lobbying. The bill, which is still before the Senate, would not apply to business organizations or professional associations. Its intent is to foster dissent within unions and lay the groundwork for union members to opt out of their union or stop paying dues. Over the last three decades, the annual incomes of top earners in Canada have more than doubled while the median taxpayer’s income has remained relatively stagnant.Income inequality has increased during the Harper government. The top one per cent of earners is taking home an ever-greater share of the national income. While some of the increasing wealth gap can be attributed to the effects of globalization and loss of unionized manufacturing jobs, much of the gap is caused by federal tax and fiscal policies. More families live in poverty than was the case in 1989 when the House of Commons passed a unanimous motion to end child poverty by the year 2000. According to Campaign 2000’s 2014 Report Card on Child and Family Poverty in Canada, “child and family poverty has increased to 1,331,530 children (19.1%) from 1,066,150 children (15.8%) in 1989…” In Aboriginal communities, where the federal government has the primary responsibility for income support and community services, one out of two children lives in poverty. Canada is among the developed nations that do the least to reduce inequality through taxes and transfer payments. Canada’s ranking on income equality is 9th among OECD nations when calculated on the basis of market income; it falls to 19th on the basis of after-tax income. The Harper government’s tax policies that have, overall, favoured the wealthiest Canadians include income splitting, tax-free accounts and such “boutique” tax policies as the children’s fitness, green renovation, university textbook and adult gym membership tax credits. Overall, Canadian women have achieved high levels of education and health, but these benefits are not shared equally among women in Canada. Nor have they translated into economic equality or equality in leadership roles. A 2014 Canadian Centre for Policy Alternatives report to the United Nations highlights areas where gender inequality in Canada has persisted or worsened. These include violence against women, political participation, representation, economic security and access to social services. The report also turns the spotlight on the additional barriers faced by Aboriginal women and girls, racialized women, women with disabilities and women from sexual minorities. The Canadian gender pay gap is the eighth largest among OECD countries. Women are more likely than men to work part-time: 26% vs. 11%. Women are nearly twice as likely to work in minimum wage jobs. Women are consistently paid less than men, even when working in the same industry and when they have equivalent education. The federal government could do more to address gender inequality. One key policy area is child care. When first elected, the Harper government cancelled the national framework for child care and phased out billions in transfer payments to the provinces and territories that supported child care services. In its place, it established the Universal Child Care Benefit that does little to make child care affordable and nothing to create the child care spaces parents desperately need. The Harper government’s tax proposals for income splitting, which favour families where one income earner earns significantly more than the other, is a direct disincentive for women to work outside the home and contributes to their economic insecurity. Each year, over one million women in Canada experience harassment, domestic abuse and violence at the hands of their partners or people they know. A 2009 federal government study estimated the economic cost of this violence against women amounted to $7.4 billion, an amount that includes costs related to the justice system, medical and social services costs to support victims and children, and economic costs due to lost wages and lost opportunities to pursue education and training. Particularly alarming is the fact that, since 1980, close to 1,200 Aboriginal women and girls have been murdered or gone missing. The Harper government has steadfastly refused to launch an inquiry on the issue. The Harper government has an abysmal record on Aboriginal issues. Aboriginal communities lack adequate housing, clean water and economic opportunity. Particularly frustrating is the government’s record on Aboriginal education, a direct federal responsibility. Per pupil funding for Aboriginal students is, on average, $2,000 to $3,000 less than for students funded by their provincial governments. The funding differential has a significant impact on the ability to provide classroom resources and retain qualified teachers. Aboriginal graduation rates are far below those of other students. In 2013, the government introduced the First Nations Education Act, but it was abandoned when Aboriginal leaders rejected the government’s terms and complained of lack of consultation. They are concerned the funding would be insufficient, the government would retain too much control and their treaty rights could be at risk. In contrast to the provincial level, federal election law prevents unions from making political donations or sponsoring “third party campaigns.” This means that ETFO’s most effective strategy for affecting the election outcome is to mobilize members to vote and to take others to the polls with them. You can also make a huge difference simply by volunteering for a few hours, or more, on a political campaign. For the past decade, Conservative policies have contributed to unprecedented economic and social changes. Those who have studied Stephen Harper and the Conservatives know there is still more on their agenda. There’s much at stake; it’s up to you to have an impact. Alexander, Craig and Francis Fong (2014). “The Case for Leaning against Income Inequality in Canada,” Special Report: TD Economics. Toronto. The Broadbent Institute (2014). Stephen Harper’s CRA: Selective Audits, Political Activity, and Right-Leaning Charities. Ottawa. Campaign 2000 (2014). 2014 Report Card on Child and Family Poverty. Toronto. Canadian Centre for Policy Alternatives (2014). Progress on Women’s Rights: Missing in Action: A Shadow Report on Canada’s Implementation of the Beijing Declaration and Platform for Action. Ottawa. McInturff, Kate and David Macdonald (2015). Time to Grow Up: Family Policies for the Way We Live Now. Ottawa: Canadian Centre for Policy Alternatives.